I have always believed in angels and have always felt that I have a team of guardian angels watching over me in the spiritual world. In the last several weeks, I have seen the faces of angels who walk among us. One angel came to visit me and she was armed with several meals that she had prepared for my family along with an enormous gift bag from my flock of angels (a.k.a. co-workers) at work. 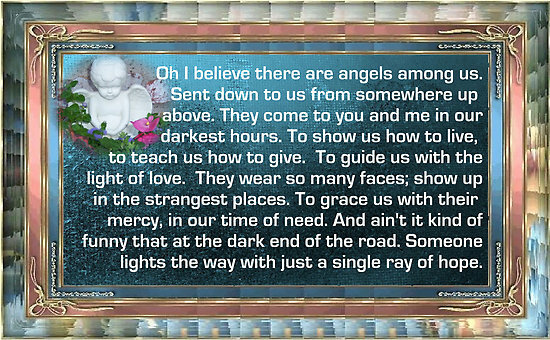 Another angel is my aunt who is also a two-time cancer survivor. She has been a tremendous source of support to me with tips on dealing with the upcoming chemo, hair loss, and navigating the cancer diagnosis and “year’s worth of stuff to deal with.” Another angel is my best friend since birth who has answered my many medical questions (she’s an RN) and been a wonderful source of emotional support for me. There is an angel in a fellow mom who has offered to help transport my kiddo during basketball season. Many more angels — including more members of my family — have offered me support, transportation, meals, etc. I had breakfast with a wonderful friend earlier this week. She and I met through church and have developed a warm friendship. She also happens to be a two-time cancer survivor who has the same oncologist that I have. I have had lots and lots of support around me in recent weeks and I’m grateful for all of it and I pray that it continues. However, there is nothing like being able to chat with a fellow cancer survivor who knows “all the parties involved” – the doctors, nurses, medical facilities, medical tests, the lengthy drive, etc. We discussed the differences in our cancers and our incisions. We discussed how our families have been affected and we discussed various bumps in the road (both literally and figuratively). We discussed getting everything in place from a legal standpoint. I was able to lament about the last bath I was able to take in my garden tub with water jets. (It was the day before my first surgery.) I have not been able to take a long hot bath since then due to my incisions and she understands. As I think about the “minor” surgery that is scheduled for tomorrow to put in the IV and IP ports for chemo, I am so grateful to be able to share my experiences with this wonderful friend. Every surgery carries risks – no matter how “minor” it is — and she understands. She has offered to do laundry for me. She gave me tips on music to listen to in order to keep me in “fight mode.” She has given me tips on how to keep my head warm and what fabrics don’t irritate the scalp. She has offered to take me to chemo treatments and entertain me. I was also able to ask her to be a “Standby Mom” to check on my kiddo if needed which she quickly agreed to without any hesitation. She is another angel on my team who walks among us. There are angels everywhere. They show themselves in very caring ways. Who knows? You might even be an angel to someone who appreciates you. I love you, Seana! You will be in my heart all day today. I’m thinking the words “Go! Fight! Win!” of a cheer for you.